The most annoying thing about Little is just how much I wanted to like it even though I was coming perilously close to loathing every second I was sitting in the theatre watching its reverse Big scenario play out to conclusion. 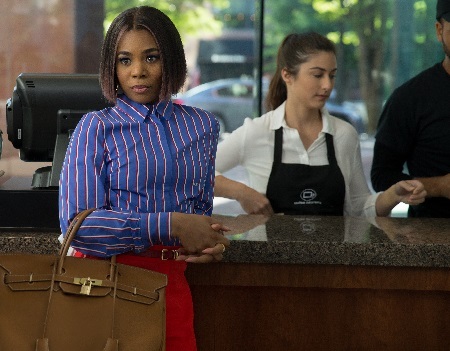 Regina Hall should have been perfectly cast as the main character, tech industry CEO Jordan Sanders, the ferociously nimble actress made to order to be wearing the designer heels of this Ebenezer Scrooge-like monster who gets magically transformed into her 13-year-old nerdy self of 25 years prior. 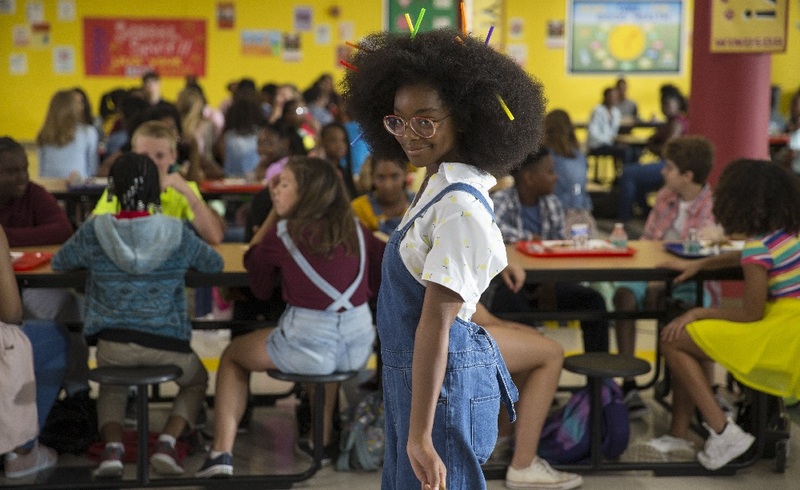 On top of that, “Black-ish” star Marsai Martin is a scene-stealing wonder as said middle-age adult now trapped back in her own teenage body, the young actress a delightful dynamo as she struts through the movie with a precocious hard-edged confidence that’s superb. Throw in the luminous Issa Rae (“Insecure,” The Hate U Give) as Jordan’s harried assistant April Williams and an incredibly gifted trio is unequivocally in place, and the thought they wouldn’t be able to deliver the entertainment goods was the furthest thing on my mind as the film began. But the script from director Tina Gordon (Peeples) and Tracy Oliver (Girls Trip) is a frantic muddle that doesn’t know when to quit, frequently taking jokes much further than they need to go in order to retain their humor. It does a horrible job of making its fantastical premise believable, alternating between grounding these happenings in honest human emotions and at other times taking things so far over the top it all becomes crushingly absurd. There’s little nuance or subtly involved in any of this, the volume turned all the way up to 11 for almost every second of the feature’s deadly 109-minute running time. It moves in fits and starts never achieving any comedic or dramatic momentum, and for every funny moment or moving scene there are countless others that are so ponderously leaden I let out an exasperated sigh every time the motion picture wasted more of its inherent potential. The scenario is pretty simple. After an epically bad morning, the self-centered and domineering Jordan Sanders badgers a 13-year-old girl (Marely Taylor) for calling her out for being mean to her employees only for the youngster to playfully curse her to be “little” while twirling around a magic wand. Thing is, what was meant to be a joke ends up being anything but. The next morning Jordan wakes up in the body of her 13-year-old former self, a frizzy-haired youngster who spent middle school being pitilessly bullied by all the popular kids because of her peculiar looks and fondness for scientific experimentation. In order not to be put in the custody of Child Protective Services this adult in a kid’s body is forced to reach out to her disgruntled assistant April for help. Jordan puts her in charge of her company until the two of them can figure out how to revert her back to normal, and in doing so learns a handful of life lessons that will hopefully make her a better person if the magic spell can be undone. There’s not a lot more to it. Jordan obviously ends up right back at the very middle school she was almost bullied out of 25 years earlier, making the acquaintance of the current set of eighth grade outcasts (JD McCrary, Tucker Meek, Thalia Tran) as well as the current queen bee (Eva Carlton) on her first day of class. As for April, she has to find the confidence to speak up for herself, discovering her voice after she’s forced into this leadership role while at the same time showing her boss that treating others with kindness and respect gets more out of them than yelling and belittling their efforts on a regular basis could ever hope to. It’s pretty straightforward and takes precious few risks, everything building to a foregone conclusion I can’t imagine anyone anywhere being surprised by. With a cast this talented, however, that honestly shouldn’t be that big of a problem. The thing is, as terrific as Martin and Rae might be, Gordon’s movie is at constant war with itself. It is as if the director can’t decide if she wants to play things as broad fantastical farce, whether she wants to push the envelope of good taste as far as the sexual innuendo and more lascivious content is concerned, or is instead keen to embrace the scenario’s more obvious melodramatic facets in order to force a few tears out of the viewer’s eye sockets. There is no cohesion, no sense of pacing or time, character arcs having little meaning other than they need to get everyone to a certain place by an anointed time and for no other reason, any semblance of reality, nuance or character-driven purpose all but absent. Then there is Hall. The actress gave my favorite performance of 2018 in Andrew Bujalski’s Support the Girls. She has been masterful in movies as varied as the About Last Night remake, Love & Basketball and even Girls Trip. Here, however, Hall just isn’t given material she can do anything with. She tries, goes above and beyond, but her version of Jordan Sanders simply doesn’t work. It’s impossible to believe anyone would keep working for this woman, let alone that April would have put up with being her assistant for three years considering the levels of mistreatment that is tossed her way. I just didn’t care about her and as such I never believed anyone would be there for Jordan in a time of need, and while Hall does what she can there’s just so little about the character that works none of her efforts end up mattering in any substantive way. Most egregiously, the movie never knows when to say when. It has these individual moments that work beautifully, little snippets of humor and insight that are shockingly successful. Problem is, they are all almost immediately undercut because Gordon apparently didn’t want to let go of them. Scenes go well beyond their breaking point, transforming what could have been an insightful humorous gag or a movingly sincere dramatic revelation into a detestable waste of time that dilutes the impact and power of everything that had just come before. 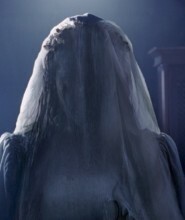 Every time I felt like the film was starting to win me over, most often due to something either Martin or Rae happened to be doing, it would do something grotesque, smarmy or borderline repellent that would force me to shake my head in disappointed anguish, and like a guillotine blade covered in blood any chance there was for pleasure was severed right at the head never to be heard from again. Little is a big case of missed opportunities left to rot in the sun, the resulting stench so heinous here’s hoping I’ll never have to smell their like again anytime soon.